"I think that you have one of the most UNIQUE ideas for party/crowd pleasing games [Death on the Gambia, below] of all times and believe me, that's a huge compliment coming from me… Keep up the good work! I would recommend that you somehow get the word out about yourselves because I know that more people would certainly order your product if they just knew! " "Wow!!! What a great game! Death on the Gambia was a huge success with my usual suspects. We have played all the 'how to host a murder' games and found them pretty thin stuff. We have been casting about for a couple of years looking for better options and have found one in your line of games... We shall be placing another order soon. Thanks for a great evening." "Death on the Gambia was a ton of fun. We loved how involved the subplots were. Additionally, the weapons and threat of death added another level of secrecy regarding character development that everyone loved. The threatening and fighting was a blast! People didn't know if others were going to kill them and there was a lot of fighting in the first half of the game (which I thought was really fun since no-one was taken out of the game early). I really enjoy the French / British spy aspect of the Gambia, with the potential of someone being suppose to kill someone else. A friend of mine is planning a Lei'd to Rest night coming up and I am really looking forward to it! " "They loved it [Death on the Gambia]! It was hard to gauge success at the time because I was so concerned with hostess duties and keeping the game on track. When it was over and I had a chance to relax I realized that it was a huge success. It's just not your run-of-the-mill party. I heard about it for many days after. One couple even asked me to host one at their house. And they all want me to do it again next year!" "I bought Death on the Gambia for my birthday party. It was absolutely splendid! All of the guests had a fabulous time. I was very worried that it would be too complicated or the guest wouldn't want to play, but everything was terrific! The character descriptions really got my guests into it, and the sub-plots just made it more interesting. Everyone had a great time and I wanted to personally thank you." "Many thanks for your great contribution [Death on the Gambia] without which we certainly would not have got together we came from all over the country and the props created by everyone were fantastic. We had appropriate food and the insect sounds, along with ship's bell, sail, overboard and bridge!!! Great fun by all. Thanks." "Just hosted my first (and definitely NOT last) murder mystery party; Death on the Gambia. What a wonderful time, was a little worried about the guests getting involved in the game. No worries, about 10 minutes into the game, they became their characters! By the end of the evening several had suggested that we do this again, soon. Thanks for the great characters, instructions, and helpful tips. Thanks again!" "Death on the Gambia was a fantastic night, I think you have to have the right mix of people but it was utterly brilliant! More, more!" "We chose Death on the Gambia upon your recommendation for a family event. It was our first attempt at this. It was a lot of fun! The kids want to do it again soon. We'll pick another game and have another fun evening." "I hosted Death on the Gambia for a New Year's Eve party, and my guests loved it! It was our first time playing an interactive murder game, and they were all surprised at how much fun they had. They all marvelled at the complexity of the game, and they talked for quite some time, and are still talking about it several days later! Great game!" 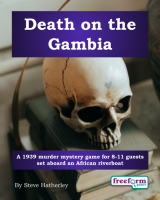 Death on the Gambia is a dinner party murder mystery game for 8 to 11 guests and a host – download the free introductory pdf file. Join us in a thrilling evening of plotting, mystery and treachery. You will be in the middle of the action and it will be up to you to wheel and deal with the other guests. Can you achieve your goals, keep your secrets hidden and survive Death on the Gambia? It's up to you. Death on the Gambia lasts for about four hours and is suited to an evening. It is often played over a meal – a finger buffet if possible to allow guests to circulate and talk in private. "Death on the Gambia was fantastic! The theme, game play, props, costuming, and murder and treachery was everything I hoped it would be for our Murder Mystery Party! If you like or think you might like a role-playing type party, this one is absolutely wonderful for family and friends from high school age and up!" The free introductory pdf file contains an introduction to the game, a cast list of all the characters, and a copy of the Gambia Tribune – plus details of how to buy the game. Alex Thomas – Chief buyer for the Happy Peanut Spread Company. Captain Sam Ironheart – Captain of the Christabel. Caroline Tanner – An English widow seeing the world. Connor McDouglas – A rugged Scottish archaeologist, adventurer and finder of antiquities. Dexter Fairchild – An intrepid big game hunter from England. Gabe Schwartz – A brilliant German doctor bringing aid to the peoples of the jungle. Jane Carter – An American journalist working for the Gambia Tribune. Joey Keene – One of Gambia's finest detectives. Katanga – A native of Gambia and First Mate aboard the Christabel. Marie Renard – A famous French artist. Vic Townhill – An English missionary. Death on the Gambia is unlike many murder mystery games. This game, unlike most of our mysteries, doesn't start with a murder. However, by the end of the journey it is unlikely that everyone will survive! Death on the Gambia is played just like a murder mystery game. You may be trying to solve the murder, but primarily you are (initially at least) concentrating on your own goals and objectives. Unlike most boxed murder mystery games, Death on the Gambia lets you decide how to achieve your goals and thwart your enemies. "Everyone enjoyed Death on the Gambia and came in character to the party and stayed in character the whole evening and even for the next week!! Thank you for the game. It made an unforgettable evening for my guests." On the evening of the game the guests are met by the organizer, the deckhand of the old riverboat. They then receive their detailed backgrounds - including dark secrets, objectives and money. When everyone has arrived the Christabel casts off and starts the voyage along the River Gambia to Bathurst, Gambia's capital city. The fun then begins as everyone questions, bribes and blackmails each other. As the evening progresses they may even try to murder one another! Finally, the Christabel arrives in Bathurst and everyone finds out how they did, and what what secrets everyone else was concealing. ALSO IMPORTANT – you shouldn't add too many of these characters in to your game as they haven't been designed to work together (unlike the main game characters). If you add in several, they may make your game chaotic and incoherent. You should probably instead choose a larger game. If you still want to add several extra characters (four or more), we recommend having an extra host to help. Death on the Gambia costs £20.00 (GB pounds) or US $29.99. You can buy it in either currency, from anywhere in the world, as you prefer. The price will be converted back into your own currency for you, at today's exchange rate. We offer a Cast Iron Guarantee on all our murder mystery games. If you're not completely satisfied with Death on the Gambia then please let us know within 30 days and we will refund you. See our full terms and conditions here.